A cozy, crackling fire awaits you. This past weekend the Innkeepers from Amil’s Inn Bed and Breakfast-Anita and David Reeck stayed with Diane and Vern Dalberg of the Cream Pitcher Bed and Breakfast for some rest and relaxation. We soon realized one night was not enough time to enjoy this beautiful Bed and Breakfast. 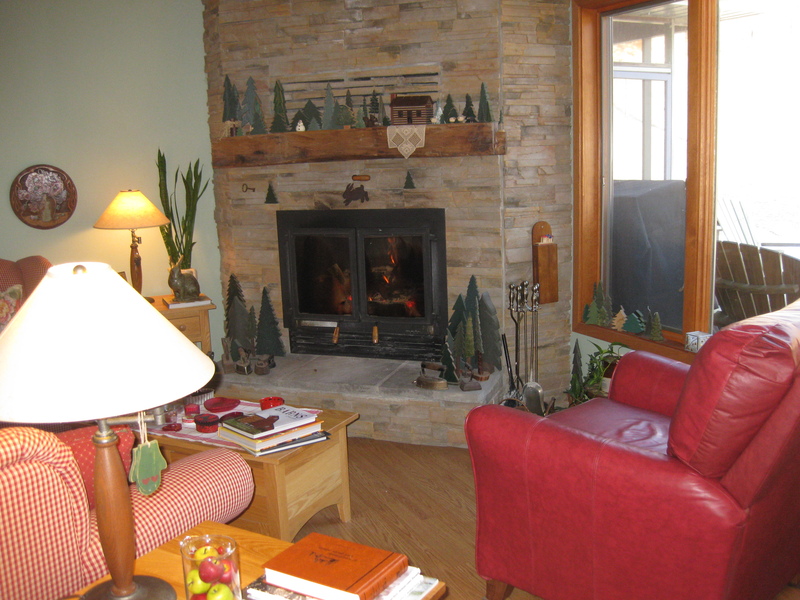 The Cream Pitcher Bed and Breakfast is situated among the hills of Richland County, this unglaciated area offers awesome beauty as well as outdoor activities in every season. There are more than 3 miles of hiking trails through the 100 acres of woodland. One may watch deer, turkeys and other wildlife; see and hear many species of birds and enjoy the creek that flows close by. The innkeepers, Diane and Vern have a large collection of pitchers from the 1930’s, 40’s, and 50’s. The home is embellished with many antiques. The Cream Pitcher was meticulously hand-crafted to ensure the proper blend between modern amenities and old-fashioned quality and comfort. Guests of The Cream Pitcher experience a retreat in nature. Sports enthusiasts can enjoy hiking, biking, cross country skiing, snowshoeing, fishing, or just relaxing. We stayed in Jared’s Room which is a spacious room with its own private entrance; a screened porch with hammock chairs, this “northwoods” room has a comfortable queen size bed, a private bath with a large, double shower. It has a great view of the woods…you can watch wildlife and listen to the birds(in fact Sunday morning we heard a woodpecker outside our window) or step outside and walk the trail into the woods. There are 3 other beautiful and spacious rooms, all with private baths and more—Kathie’s Room, Andrew’s Room and Tolena’s Room. For more information about The Cream Pitcher Bed and Breakfast and to plan your stay, visit their website: www.mwt.net/~crmptchr. You will not be disappointed. Traveling down the jump with speeds in excess of 50 MPH! The 89th Annual Snowflake Ski Jumping Tournament will be taking place February 3rd and 4th, 2012 at the Westby, Wisconsin Ski Club. Approximately 25 American and foreign competitors will jump on a large Olympic sized hill. Opening Ceremonies will begin Friday evening, February 3rd at 7:00 PM with the jumping done under the lights!! Competition begins at 7:30 PM with fireworks between rounds. Long standing jump will follow the competition and live music featuring The Freezers from 9:00 PM to 1:00 AM. Saturday, February 4th will begin with opening ceremonies at Noon. Competition begins at 12:30 PM. Long standing jump and awards ceremony will follow competition and live music featuring Tunnel Vision from 3:00 PM to 7:00 PM. A button is required to enter the tournament and are $20.00 at the gate. Children 12 and under are free as well as Military admitted free with a current military ID card or other proof of service such as VFW, Legion or DAV current membership card of their DD Form 214 and photo ID. Children under the age of 18 whose parents are currently on active duty, in the National Guard or Reserves, or are retired from any branch of the military are also admitted free. The Snowflake Ski Club was founded in 1922. It has its roots deep in volunteerism, community spirit and good will making it one of the two remaining “all volunteer” large hill ski jumping clubs in the Western hemisphere. Located in the City of Westby, a peaceful community with Norwegian roots, the Snowflake Ski Club is proud to provide a place of entertainment and recreation. Annually, the Ski Tournament is an event the entire community gets excited about. International and US jumpers compete on the large hill, often traveling down the jump with speeds in excess of 50 Miles per Hour flying for hundreds of feet!!! Ski jumping truly is the original extreme sport. The Snowflake Ski Club is very active during the summer season as well. The Snowflake Golf Course is used by hundreds of people who want to enjoy the natural beauty and tranquility of Timber Coulee. 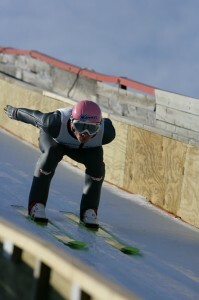 For more information about the 89th Annual Snowflake Ski Jumping Tournament go to http://snowflakeskiclub.com.